with the clinical simplicity of a unique aspheric, disposable lens. It’s also available in an advance, toric frequent replacement lens. 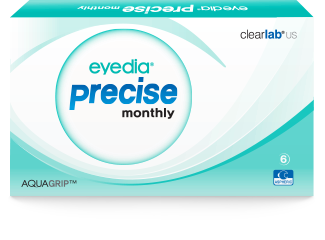 eyedia® precise monthly, a monthly wear lens with high water content lens, with AQUAGRIP™ technology offers the problem solving lens modality for people with dry eye condition. The lens also offers advanced aspheric design for true spherical aberration correction. Crisply clear vision all day long by exceptional AQUAGRIP™ dimensional stability. Prolonged moisture-drenched feeling all day long with anti-dry-out property. Silky comfort with high water content by true Hioxifilcon A formulation. Allergy free components to prevent allergic reactions of the eyes. 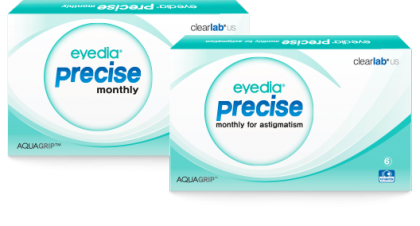 eyedia® precise monthly for astigmatism, a monthly wear lens with high water content, with AQUAGRIP™ technology offers the problem solving lens modality for people with dry eye condition. Some 25% contact lens wearers suffer from astigmatism. Clearlab is bringing the benefits of long-lasting comfort, and improved Depth of Focus to wearers with astigmatism through the advanced dynamic stabilization design. This allows lens fitting to a wider range of cylinder prescriptions than conventional torics, making lens fitting easier with a greater first time success. Superior comfort and enhanced depth-in-focus in toric vision correction by patented advanced dynamic stabilization design. Easy lens orientation by unique arrow positional mark.